Mysuru: Tomorrow is Ayudha Puja and Dasara is a day after. The city, its main thoroughfares, Mysore Palace, government and private buildings are sporting a bridal look for the occasion and people are splurging on everything that is new, fresh and sweet. 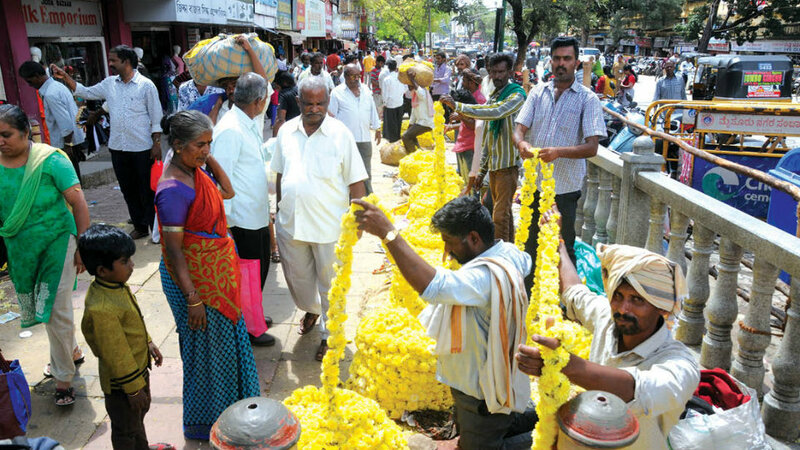 Despite spiralling prices of flowers, banana stalk and ash gourd, people thronged the markets this morning to buy puja materials for Ayudha Puja. Devaraja Market, Sayyaji Rao Road, Chikka Gadiyara, J.K. Grounds Road, Dhanvanthri Road, Valmiki Road, V.V. Puram, Vontikoppal, Nanjumalige Circle, Ballal Circle, Kuvempunagar Complex, Akki Chowka, Agrahara, Bandipalya and M.G. Road witnessed moderate to heavy crowds. All these places are likely to witness more rush in the evenings. Puja items like kadle puri, khara boondi, ash gourd, flowers, banana and mango leaves sold like hot cakes. At many places and street corners, even in residential and commercial extensions, vendors had set up make-shift tents to sell flowers and puja items. Though the prices of puja items were high, it did not deter the people from buying. 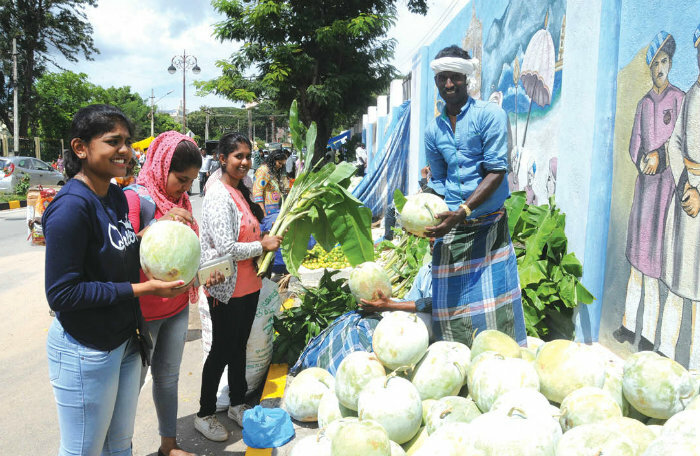 Mysuru Mallige, Marigold, Chrysanthemum flower varieties, coconuts, and banana stalks, Yelakki Banana, roses, lemon and mango leaves were in great demand. A bunch of mango leaves was being sold at Rs. 15 to 25 while coconuts were being sold at Rs. 25 to Rs. 30. Bigger ones were also being sold for Rs. 40 and Rs. 45. Small size lemon was being sold at Rs. 5 to Rs. 6 and good-sized yellow lemon was being sold at Rs. 9 and 10 per fruit. Ash gourd which is in great demand during Ayudha Puja was being sold at rates varying from Rs. 30 to Rs. 300 depending on size and weight. A small banana stalk is being sold at Rs. 30 and the prices rise depending on the stalk size. The colourful Vijayadashami procession or Jumboo Savari along with tableaux and cultural troupes will be inaugurated by Chief Minister H.D. Kumaraswamy on Oct. 19 (Friday) at the Mysore Palace premises between 3.40 pm and 4.10 pm in the auspicious Kumbha Lagnam. Prior to the CM inaugurating the procession, puja will be performed to Nandi Dhwaja near the Balarama Gate of Mysore Palace between 2.30 pm and 3.16 pm in the auspicious Kumbha Lagnam. The CM will perform puja and shower flower petals to the idol of Goddess Chamundeshwari, the presiding deity of Mysuru, placed inside the 750-kg Golden Howdah (Ambari) mounted on the broad back of Howdah Elephant Arjuna. Deputy Chief Dr. G. Parameshwara, member of erstwhile royal family Yaduveer Krishnadatta Chamaraja Wadiyar, District Minister G.T. Devegowda, Tourism Minister S.R. Mahesh, Kannada and Culture Minister Jayamala, Backward Class Minister C. Puttaranga Shetty and Forest Minister R. Shankar will be present. Governor Vajubhai Rudabhai Vala will receive the salute at the Torchlight Parade Grounds at Bannimantap at 7 pm on Oct. 19. CM Kumaraswamy will be the chief guest along with his Cabinet colleagues. The event will be presided over by MLA Tanveer Sait. Among main attractions during Dasara is the Vajramushti Kalaga which is held on the day of Vijayadashami every year. It is the centuries-old traditional wrestling contest held in the Kannadi Thotti of Mysore Palace. This year, the Kalaga will be held on the morning of Oct. 19. The special Akhada for the Vajramushti Kalaga is being set up with a special variety of mud. Ayudha Puja rituals will begin early tomorrow morning and prayers will be offered by Yaduveer who will be guided by a team of priests. During Ayudha Puja, special puja will be performed on the armoury and weaponry (Khas Ayudhas) of the bygone era as well all the vehicles and animals in the Palace. From the BMWs and other high-end cars, chariots, carriages and silver palanquins owned by the royal family to the cows and horses, all of them form a part of the puja rituals. Today was the last day of Jumboo Savari rehearsal and the elephants will take a day’s rest tomorrow to get ready for the Vijayadashami procession on Oct. 19. As part of the rehearsals, the elephants were brought out of the Mysore Palace at 7 am and the rehearsal was to begin at 8 am where City Police Commissioner Dr. A. Subramanyeswara Rao was scheduled to shower flower petals on Howdah Elephant Arjuna to acclimatise the elephants. But on Chief Minister’s duty the city top cop arrived at the venue only at 10 am and by the time he arrived, the elephants got restless. Some of them walked to rest under the trees near the Varaha Gate. Finally, the rehearsal was flagged off at 10.30 am. Dear Mr. C M , the common man has elected you to the high office to do their work. Public work is Gods work. Please Clear all pending files on your table, and also advise your team to do the same.